Though Tiffany & Co is one of the most iconic jewelers in all of the world, it has been some time since I have checked out their goods. In college you craved that little blue box so much and hoped it was holding a Tiffany link bracelet that paired perfectly with your black canvas Kate Spade. And while a link bracelet would still look classic with an arm party today (seriously, dig it out), there are some chic and modern options that will be classics for years to come but have a cool factor that works well with today's vibe. 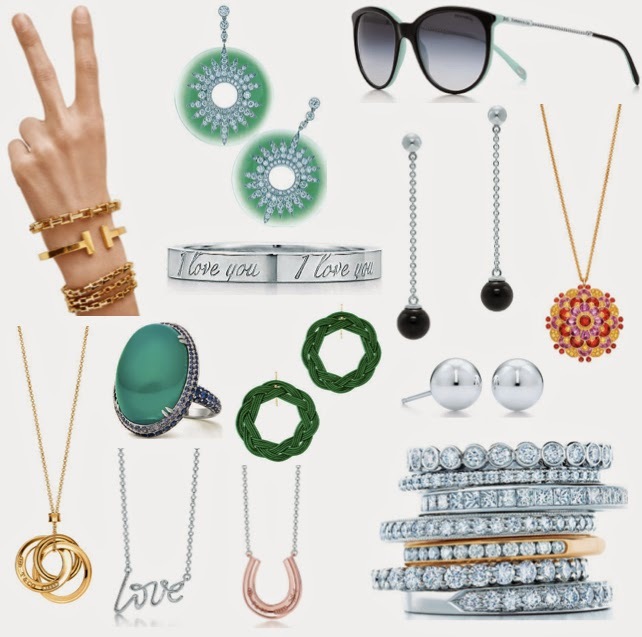 The new T collection gives us all something to add to our wish list and I am dying over those green braided earrings. There are some real investment pieces (or should I say pipe dream?) scattered in here, but also some great options for every budget. Like those black onyx drop earrings and the horseshoe necklace. And if I lived like Angelina Jolie, I would snap up those green, diamond encrusted earrings in a heartbeat. Have fun exploring! PS: Don't forget Mother's Day is coming. hint, hint boys.